It’s official – the 2019 cycling season is officially here! Last Wednesday we kicked it all off with our annual get together at the Portland Art Museum. 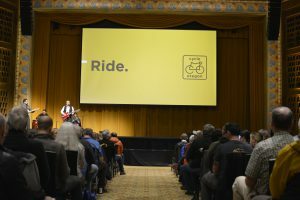 The packed house whooped it up as Executive Director Steve Schulz announced this years’ events and took us through every twist and turn of the curated selection of around 600 of Oregon’s finest biking miles. 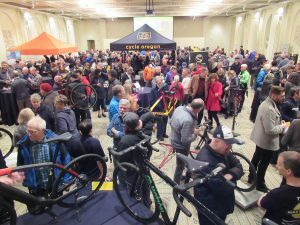 On the main floor there were shiny new bikes and setups to drool over, old friends to greet with a hug or a slap on the back, and sponsors, vendors and partners to chat up (including one new sponsor for 2019). The slideshow playing on the big screen served as a happy reminder of past rides and cherished moments. In the Grand Ballroom, Tequila Highway added a Latin beat to the festivities as riders mingled and waited for the big reveal. 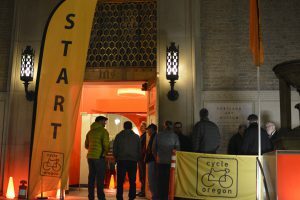 A theme that emerged over the course of the night was how Cycle Oregon has brought positive change to communities through cycling. Steve Schulz and CO board member Karmen Fore told a few stories about how grants from Cycle Oregon are helping to rebuild a historic schoolhouse in Creswell and how CO grants are being used to promote and celebrate 10 years of Oregon’s Scenic Bikeway program. For Cycle Oregon veterans, this year’s lineup brought some changes. It was announced that we will be hitting pause on WEEKENDER for this year. But Steve assured the crowd that “it will be back and it will be even better than ever”. Joyride will be branching out from the past venue of Stoller Estates to explore an all-new Willamette Valley community and the option to ride some gravel. This year Joyride is heading to Independence, Oregon. For the second running (or is it riding?) of Cycle Oregon’s newest event – GRAVEL – homebase will be Dufur, Oregon and its miles and miles of backroads and wide open spaces. And finally, the big question people have been conjecturing and hypothesizing about since last September was finally answered. The Classic will be riding the ice cream sundae that is the Central Oregon Cascades with the cherry on top being the opportunity to ride the rim of Crater Lake! The Kickoff is always a great reminder of just how special a group of people the Cycle Oregon family is and how fun it is to be around all of you. We can’t wait to get riding and we look forward to seeing you all out there! To learn more about the 2019 rides go HERE. And to watch the livestream of the Kickoff event, go HERE.